Today, seven and a half years on from the order to invade, the largest leak in history has shown, far more than has been hitherto known, just what was unleashed by that declaration of war. 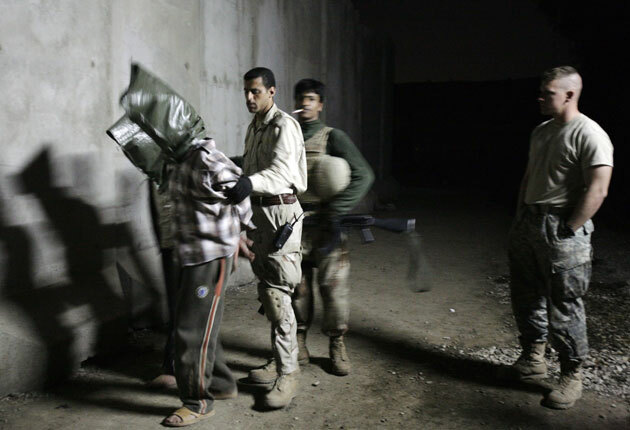 The Iraqi security services tortured hundreds, and the US military watched, noted and emailed, but rarely intervened. So now we begin to know the full extent of what Tony Blair called the blood price. A detainee tortured with live electrical wires here, children shot by US troops at a checkpoint there, insurgents using children to carry out suicide bombings somewhere else; on and on, through 391,832 documents. At the Pentagon, these messages were the day-to-day commonplaces of staff inboxes; for Iraqis, they detail, in the emotionless jargon of the US military, nothing less than the hacking open of a nation’s veins. Today, seven and a half years on from the order to invade, the largest leak in history has shown, far more than has been hitherto known, just what was unleashed by that declaration of war. The Iraqi security services tortured hundreds, and the US military watched, noted and emailed, but rarely intervened. A US helicopter gunship crew were ordered to shoot insurgents trying to surrender. A doctor sold al-Qa’ida a list of female patients with learning difficulties so they could be duped into being suicide bombers. A private US company, which made millions of dollars from the outsourcing of security duties, killed civilians. And the Americans, who have always claimed never to count civilian deaths, were in fact secretly logging them. At a conservative estimate, the new documents add at least 15,000 to the war’s death toll. It was yesterday morning when WikiLeaks, the crowd-funded website which achieved worldwide fame for releasing Afghanistan material earlier this year, uploaded nearly 400,000 US military documents. Covering the 2004-09 period, they consist of messages passed from low-level or medium-level operational troops to their superiors and ultimate bosses in the Pentagon. They are marked “Secret”, by no means the highest of security classifications. The Iraq War Logs are US documents, and so detail only a few incidents involving British troops. Two, dated 23 June 2008, record a pair of Shia men who say they were punched and kicked by unidentified British troops. Both men had injuries that were consistent with their stories. There is no record of any formal investigation. Another log, dated 2 September 2008, records that a civilian interrogator working with the Americans claimed British soldiers had dragged him through his house and repeatedly dunked his head into a bowl of water and threatened him with a pistol. The log says his story was undermined by inconsistencies and an absence of injuries. The Pentagon and the Iraqi health ministry consistently refused to publish a death toll of civilians, even denying such a record existed. “We don’t do body counts,” said US General Tommy Franks, who directed the Iraq invasion. The Iraq War Logs reveal just how hollow his words were. Since the beginning of the war, The Independent on Sunday has asserted that the true death toll of civilians in the war was far higher than military officials were suggesting. As early as 2004 the IoS reported that the Pentagon was in fact collecting classified casualty figures and that academics believed the death toll might be as much as 100,000 – or more. The logs detail 109,032 deaths, some 66,081 of which are civilians. Iraq Body Count said yesterday that an analysis of a sample of 860 of the Iraq War Logs led it to estimate the information in all the logs would add 15,000 extra civilian deaths to its previous total of 107,000. To these should be added military deaths, and IBC’s revised total deaths in Iraq would now be around 150,000, 80 per cent of them civilians. However, some care needs to be taken in using this data. The information in the logs is by no means a comprehensive tally of all deaths. The death toll of civilians is in stark contrast to President Bush’s words in 2003, when he said that new technology meant troops could go out of their way to protect Iraqi civilians. “With new tactics and precision weapons, we can achieve military objectives without directing violence against civilians,” he said. The leaked documents provide a ground’s-eye view of abuses as reported by US military personnel to their superiors, and appear to corroborate much of the past reporting on such incidents. Beatings, burnings and lashings surface in hundreds of the documents, giving the impression that the use of cables, metal rods, wooden poles and live electrical wires to torture detainees was far from rare. Although some abuse cases were investigated by the Americans, most in the archive seem to have been ignored. In August 2006, a US sergeant in Ramadi heard whipping noises in a military police station and walked in on an Iraqi lieutenant using an electrical cable to slash the bottom of a detainee’s feet. He later found the same Iraqi officer whipping a detainee’s back. The American provided sworn statements and photographs of “circular whip marks [and] bleeding on back.” No investigation was initiated. But some of the worst examples came later in the war. In one case last December, 12 Iraqi soldiers, including an intelligence officer, were caught on video in Tal Afar shooting to death a prisoner whose hands were tied. In another, US forces found a detainee with two black eyes, a bruised neck and “scabbing on his left ankle”. The detainee said he was electrocuted by Iraqi soldiers in Mosul in order to obtain a confession. Iraqi officials stated he was injured after attempting to escape. Amnesty International condemned the revelations in the documents and questioned whether US authorities had broken international law by handing detainees to Iraqi forces known to be committing abuses “on a truly shocking scale”. The UN special rapporteur on torture, Manfred Nowak, said there was a duty on the US administration to investigate whether its officials were involved in or complicit in torture. A doctor allegedly “sold lists” of patients with special needs to al-Qa’ida so they could be strapped with remote-control explosives and detonated in busy markets in Baghdad. According to the Iraq War Logs, in October 2008 a GP was arrested by US forces on suspicion of passing on the names of 11 female patients to insurgents. A file stated that the women were “likely used in the 01 February 2008 dual suicide attack on local markets”, referring to two women with Down’s syndrome who were fooled into wearing explosive vests and blown up in co-ordinated attacks on pet bazaars in central Baghdad. The explosions, which Iraqi officials said were detonated by mobile phone, killed at least 73 people and wounded more than 160. It wasn’t an isolated incident – on 4 April 2008, a “mentally retarded” teenage boy blew himself up at a funeral in Diyala Province, north-east of Baghdad, killing six and injuring 34. He had, the log suggested, the “facial features of a person with Down’s syndrome” and was part of an “ongoing strategy” to recruit individuals with learning difficulties. And, on 28 February 2008, a mentally ill teenage boy was shot and injured by a US patrol while attempting to flee his kidnappers who were intending to use him as a suicide bomber. Among companies named in the Iraq war logs is a US firm called, of all things, Custer Battles. During the six years covered by the reports, at least 175 private security contractors were killed. Most of the dead were Iraqi drivers, guards and other staff. The Bureau of Investigative Journalism says the war logs detail 14 wrongful killings of civilians by the American security company formerly known as Blackwater. It is alleged that in one-third of the cases, Blackwater guards fired on civilians while guarding US officials. The company has earned more than $1.5bn (£950m) since the 2003 invasion. On 14 May 2005 the logs allege that Blackwater shot a civilian car, reportedly killing the driver and injuring his wife and child. The guards drove on and left the injured woman and child. A year later, on 2 May 2006, Blackwater guards opened fire on an ambulance attending the scene of an IED, killing the civilian ambulance driver. Blackwater changed its name to Xe Services in 2009 after an incident in 2007 in Nisour Square, Baghdad, in which its security guards were involved in a shooting that killed 14 civilians. After the Nisour massacre the Iraqi government demanded that Blackwater leave the country. Xe Services is still one of the US government’s largest security contractors. A US Apache helicopter was ordered to kill two Iraqi insurgents who tried to surrender. The pilots of the helicopter were advised by a military lawyer that the men could not surrender to an aircraft, and thus were still targets. The gunship launched a Hellfire missile at the truck, but the men fled the vehicle and ran into a nearby shack. The crew received further instructions to kill the men, and succeeded by firing 300 rounds a minute from the Apache’s 30mm cannon. As many as 30 children died at the hands of US forces at military checkpoints, the Iraq war logs have revealed. Violent “escalation of force” (EOF) incidents as vehicles were slowed down and searched “often” resulted in the deaths of innocent civilians, according to the classified documents. Another detailed an incident in June 2005, where US soldiers fired warning shots at the grill of a car from 150m away. When the car finally stopped, seven were dead – including two children – and two were injured, because their parents had told them to lie on the floor of the car for safety. The logs detail the deaths of “significant” numbers of Iraqi civilians, including an unborn child, at checkpoints between 2004 and 2009. Of 834 people killed, 80 per cent were civilians – bringing the total dead to 681. A photographer embedded with the First Brigade of the 25th Infantry Division in January 2005, in Tal Afar, north-west Iraq, witnessed the deaths of Camille and Hussein Hassan, who were travelling with their six children. Rakan Hassan, 11, was shot in the spine and paralysed – and his family was offered just $7,500 (£4,782) in compensation by the US Army for the loss of the two parents at $2,500 (£1,594) each, and an extra $2,500 (£1,594) for damaging the car (pictured). And on 29 September 2004, a car approaching a checkpoint was fired on by US soldiers and swerved off the road into a canal 1.5km north of Saqlawiyah, near Ramadi. It sank, drowning six people – two women, three children aged between five and eight, and a baby. Analysis of the logs by the Bureau of Investigative Journalism and Channel 4’s Dispatches showed that, over the six-year period, four times as many civilians were killed in EOF incidents than those listed as insurgents. Americans are now the most hated people in the middle east, if not in the whole world-all because of the foolish foreign policies carried out in the name of the american people by the american government. If people want to understand why terrorists target the West, they should examine the Wests action-in Israel, Iraq and Afghanistan.Terrorists do not target the West because of the freedom of its society, as is claimed by governments of the West. They target western targets because they are angry and frustated because their lands have been stollen from them, their women raped and abused, their children not allowed to go to school and instead tortured and killed-all this as a direct consequence of Western policies, which themselves are based on greed and the hunger for oil. The west reaps what it sows. No; I do not believe, due to lack of evidence, that Muslim terrorists exist, much less target Westerners. These leaked documents are suspect for many reasons. The majority of previously documented abuses were carried out by US forces, not Iraqi. Bringing me back to the question of Islamic terrorism directed against Western forces: there exists Israeli terrorism masquerading as Islamic terrorism. This is provable. Think of but one Islamic terrorist who has ever been convicted of a crime in an International (and fair) court. One?